The account by Elizabeth Collier came one day prior to the official surrender of Confederate general Joseph Johnston and his men to Union general William Sherman at Bennett Place in Durham, North Carolina, on April 26, 1865. Discussion of surrendering was going on for over a week when Elizabeth Collier wrote her entry. Collier, at the time, was around 21-years-old and lived in Hillsborough, North Carolina, although she was originally from the Goldsboro region. Collier discussed in her diary, briefly, the surrender by Johnston. Collier wrote her opinion, questioning if she and others could live with those that had killed their family members and friends and those that desecrated their homes and property, as Sherman and his men did on their march through North Carolina. The answer for Collier was never; her pride still rang strong, even after Sherman and his men brought war to the Southâ€™s home front. Collier believed the South had a just cause and continued to believe so and that God would help. Sherman hoped to crush such ideals that Ms. Collier possessed. Nevertheless, as shown, he was unable to do so and Confederate pride still existed because of the personal vendettas that had happened previously to her, even though the war was essentially over. 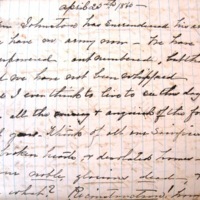 The main image is of Collierâ€™s diary entry from April 25, 1865. Elizabeth Collier Diary 1861-1865, Southern Historical Collection at the University of North Carolina at Chapel Hill. Gen Johnston has surrendered his army! We have no army now-We have been overpowered-outnumbered, but thank God we have not been whipped—Did I ever think to live to see this day! After all the misery & anguish of the four past years-Think of all our sacrifices—of broken hearts, & desolated homes-of our noble, glorious dead--, & say for what? Reconstruction! How the very word galls—Can we ever live in peace with the desecrators of our homes & the murderers of our Fathers, Brothers & Sons—Never—We are bound to rise again—My God is it thy will that we should be conquered? Oh I had such supreme faith—such profound belief in the justice of our cause—that I thought it impossible for us to be vanquished—Surely oh My God thine our hast not ben deaf to the fervent prayers for our success which have ascended nigh & day? Teach us to say They will be done on earth—Good may yet result from evil—God has some wise, & hidden purpose in thus punishing us—Perhaps we were too presumptuous—we relied too much upon his favor when we had no right to expect it—God knows what is best for as a people as well as individuals. 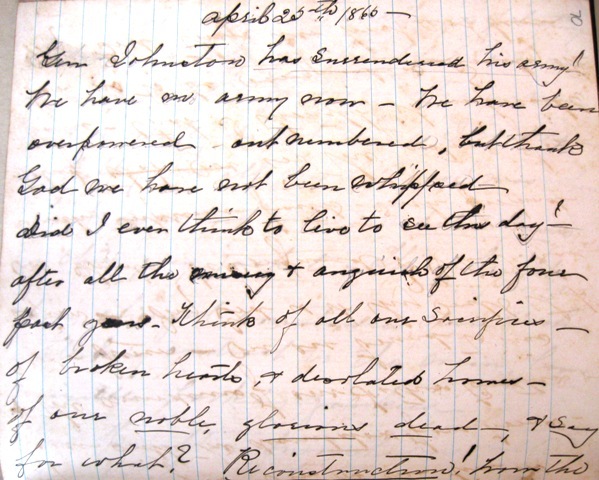 Elizabeth Collier, Diary of Elizabeth Collier, April 25, 1865, Civil War Era NC, accessed April 24, 2019, https://cwnc.omeka.chass.ncsu.edu/items/show/178.